A month ago, Whole Foods, in an effort to counter their image as over-priced, expensive food for elite people who could afford it, invited several food bloggers to take their “Whole Foods Hacks Challenge” and create a menu with 14 meals to feed a family of four on $125 a week. Combine this disconnect with outspoken missives, and you have a PR nightmare. John Mackey has been described by Gary Hirshberg, the C.E.O. of Stonyfield, “He is Whole Foods management’s greatest asset but also, at times, its greatest challenge.” It didn’t help when Mackey compared Obamacare to “fascism” and said that people who couldn’t afford healthcare should eat at Whole Foods, instead. (I thought that I’d read once that he even claimed only people who could afford to shop at Whole Foods deserved to have decent food, but I cannot find the reference now). This right-wing, outspoken, self-serving banter by the co-founder and C.E.O., paired with Whole Foods’ tendency to buy out the competition and then jack up prices, (many items rose by 15-20% after they absorbed Wild Oats), has earned Whole Foods the reputation of elitist health food, only affordable by a few. Many health food stores sell higher quality merchandise, hence, more expensive, but Whole Foods is often called (at least by my sister-in-law) as “Whole Paycheck.” (Similarly, another local health food chain here, Earth Fare, used to be called “Dinner for the Earth,” but was called “Dinner for the Rich” by the locals, until they changed their name). The extreme Corporate culture (embraced by Mackey, who believes in Capitalism whole-heartedly) only exacerbates the divide between “affordable, healthy food” and libertarian, “only those with money deserve to have good food”, corporate elitism. How to overcome the negative image? 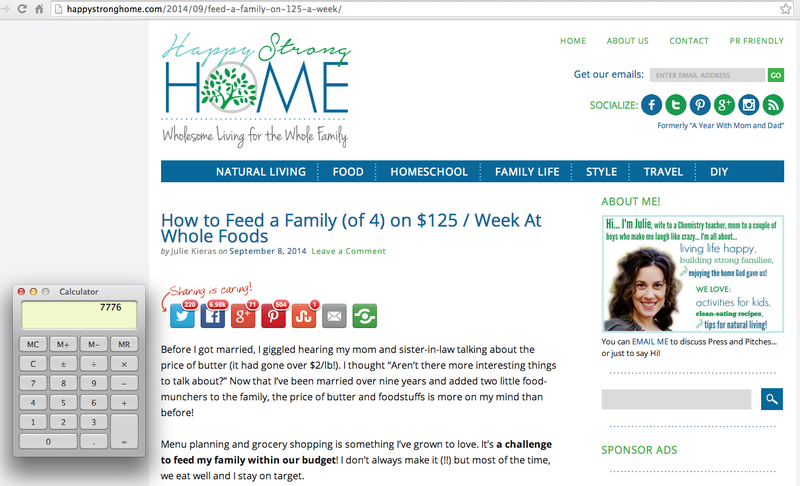 I’m sure that in participating in the challenge, she was essentially gifted with that $125/wk grocery expenditure. I hope so, anyway. $500 per blogger is not a large expenditure for a large, profitable corporation like Whole Foods, and the repairing the image can be priceless. 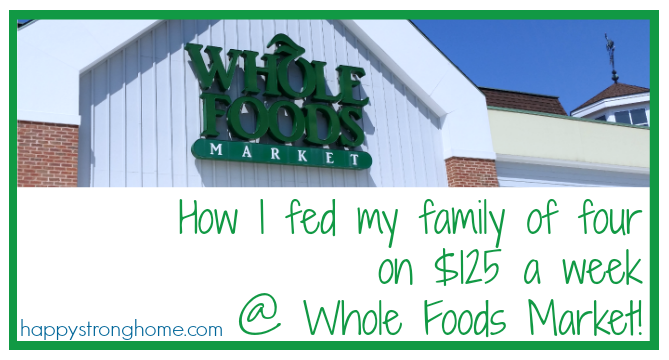 Bloggers also received Whole Foods Gift cards to give away on their sites, so it was truly a win-win situation. We can examine the impact of the campaign by looking at several social media “listening” tools. 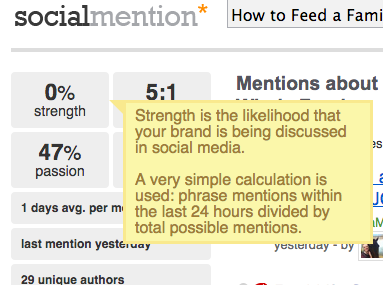 But let’s start first at the blogger’s site itself, which has a handy “social media icon sharing” toolbar, with numbers referencing how many times people have interacted with this site to actively share this article with their friends. Mostly what comes up is links to where this phrase is mentioned, but in the upper left, we get an immediately-useful block of information, namely strength, sentiment, passion, and reach. If you mouse over each one, you get an explanation of how that “score” is determined. 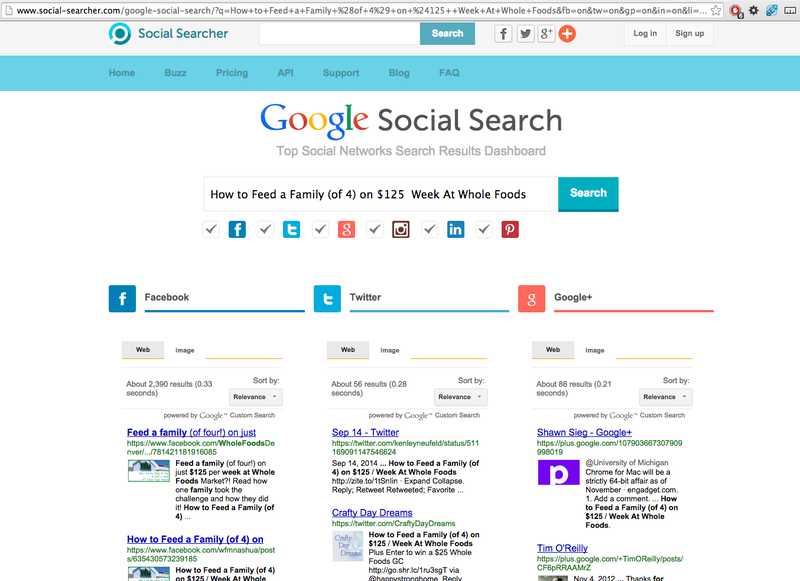 Another listening tool is by Google (of course), and while Google Analytics is awesome for tracking stats on your own site, Google Social Search is how you can track specific social platforms/channels for mention of the search phrase. As we can see, this campaign seems to be strongest on Facebook, with 2390 results as opposed to 56 for Twitter and 88 for Google+. But what if we want more information? 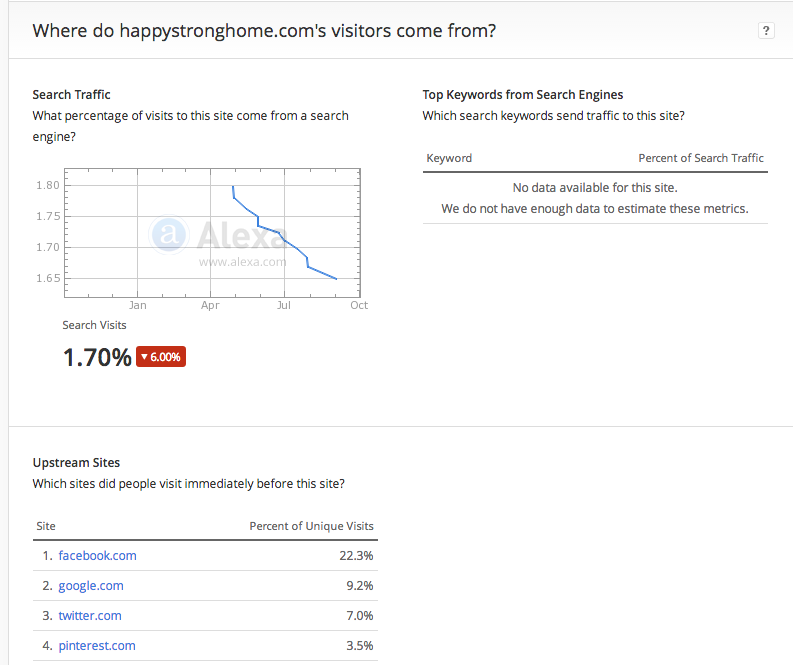 What if we want to see how our competitor’s sites are doing? What their demographic is? Hit count, bounce rate (times people have navigated to the site only to “bounce” immediately off without engaging), etc.? In my quest for more information, I discovered Alexa, which provides a lot of information for free, and even more for sale. 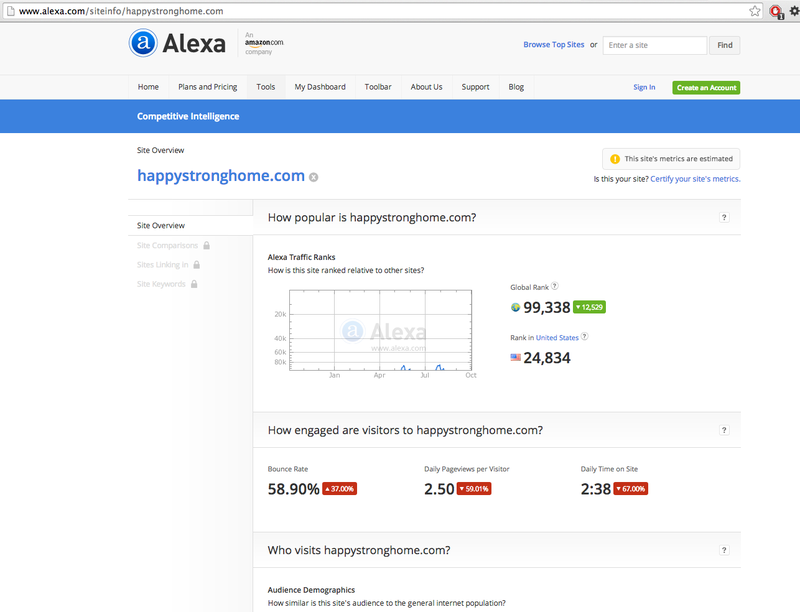 I could not find the specific social media campaign by the search phrase that I used for the other social listeners, above, but what Alexa DID do was find the most prominent of the blogger’s sites to profile, instead. 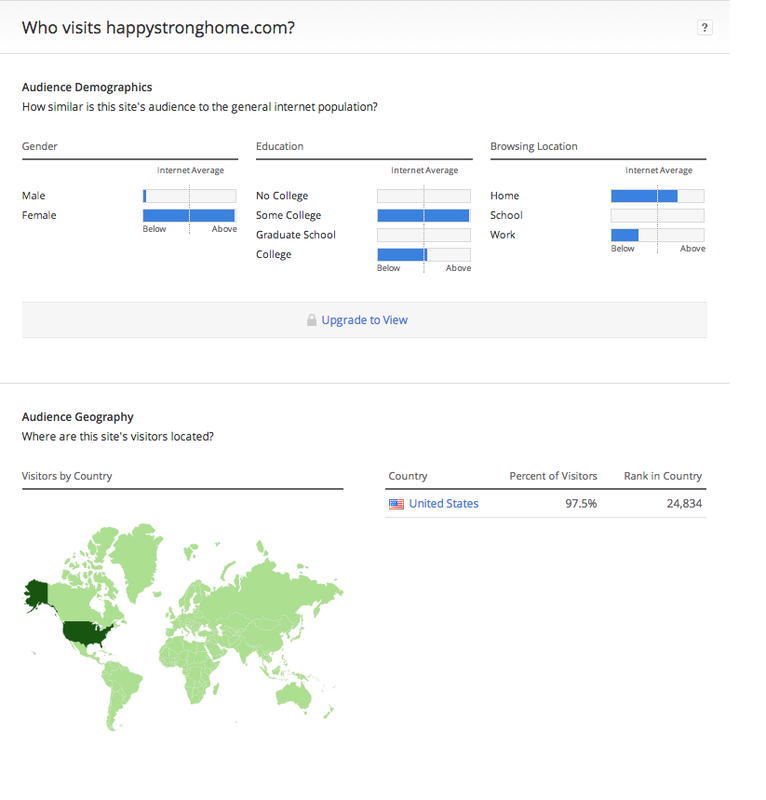 As you can see, we can tell a lot from just looking at the blog stats to see who is being exposed to this social media campaign–mostly women with some college, mostly browsing from home, and primarily in the US. 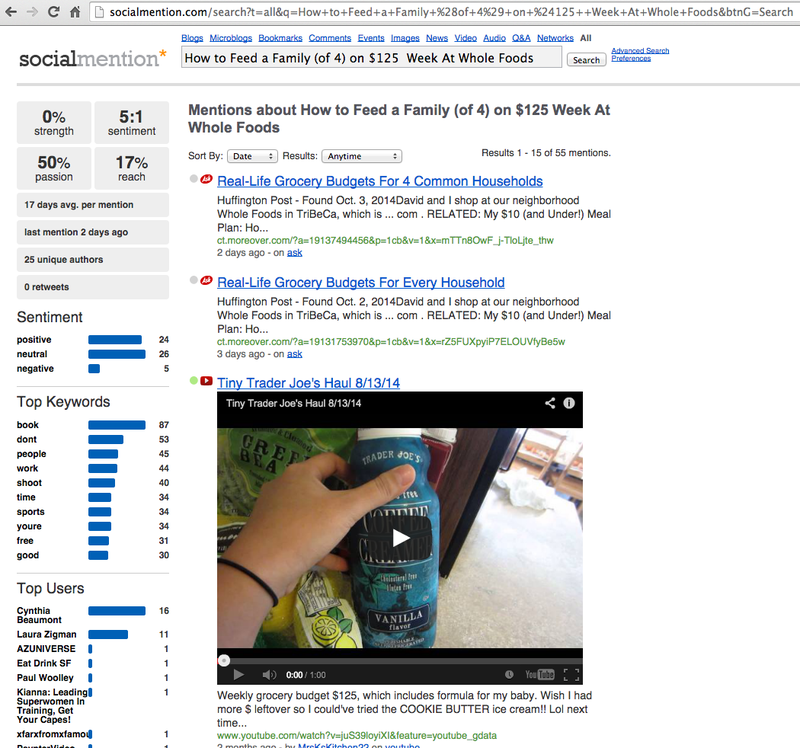 Scroll down and you get even more stats, such as where people are finding the blog, such as organic searches and social media platforms. It’s good to know, in a social media campaign, which platforms are performing well, and which ones could use improvement. In my mind, the jury’s still out on the effectiveness of this campaign. Looking through some of the comments on the Whole Foods Facebook page about it, some people are enthusiastic, while others are still saying it’s too expensive, and even $125 a week is out of their budget. But then, it looks to be a recent campaign, so it could pick up steam. At least the conversation has started, and there are some yummy new recipes to explore on a budget, so we all benefit. Paumgarten, Nick. “Food Fighter – The New Yorker.” The New Yorker. 4 Jan. 2010. Web. 2 Oct. 2014. <http://www.newyorker.com/magazine/2010/01/04/food-fighter>. Tzimisce. “The View from a Former Whole Foods Employee (Updated).” The View from a Former Whole Foods Employee (Updated). 13 Aug. 2009. Web. 2 Oct. 2014. <http://www.dailykos.com/story/2009/08/13/766208/-The-view-from-a-former-Whole-Foods-employee-Updated>.